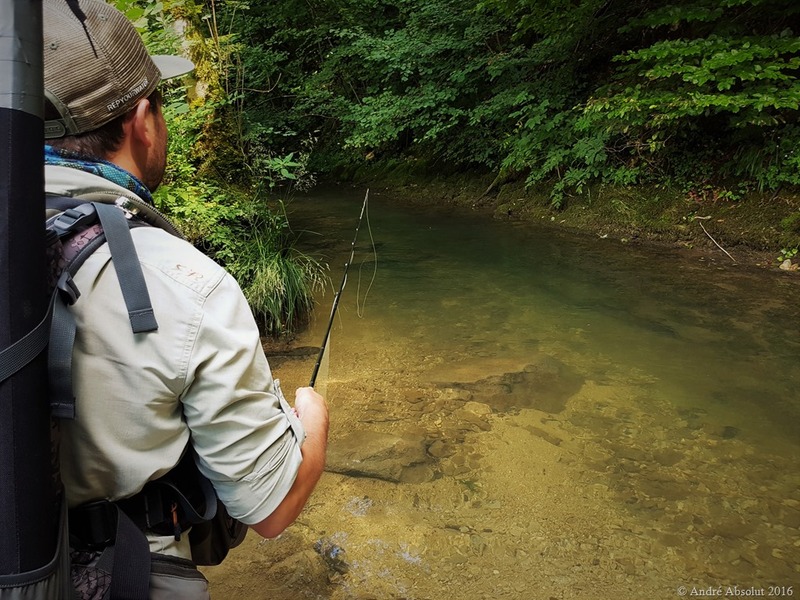 On the first weekend of August I went fly fishing and exploring the Jura mountain creeks together with André Absolut. 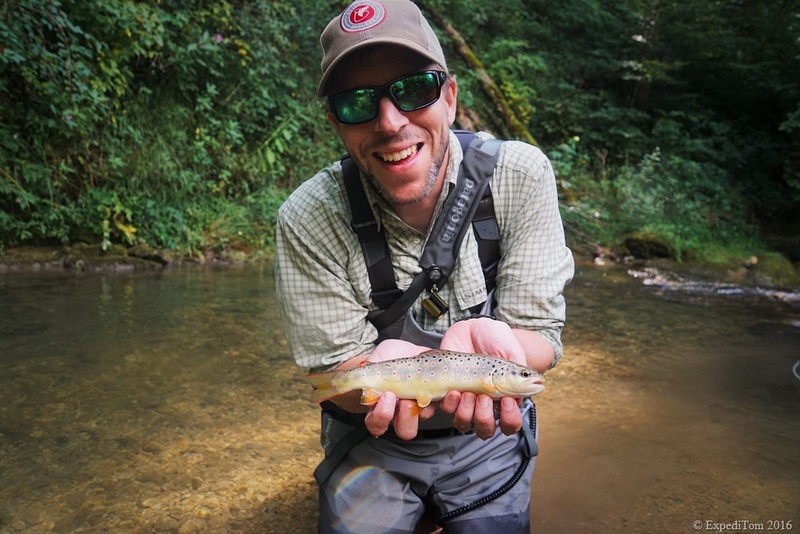 André is an avid and highly skilled fly fisherman who you may remember from the images in the recent post called Guide to fly tying meetings. He is the organiser as well as originator of the Fly Friday. In the morning we drove windy roads into the Jura mountains and climbed down to the first small creek, which André had visited already some time ago. To me, this little place of heaven was new territory. 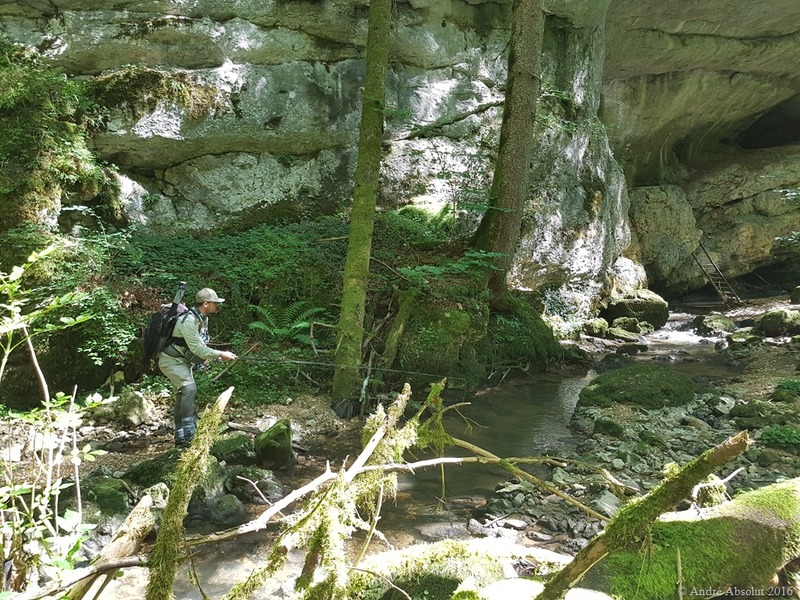 There, we began exploring the Jura mountain creeks. 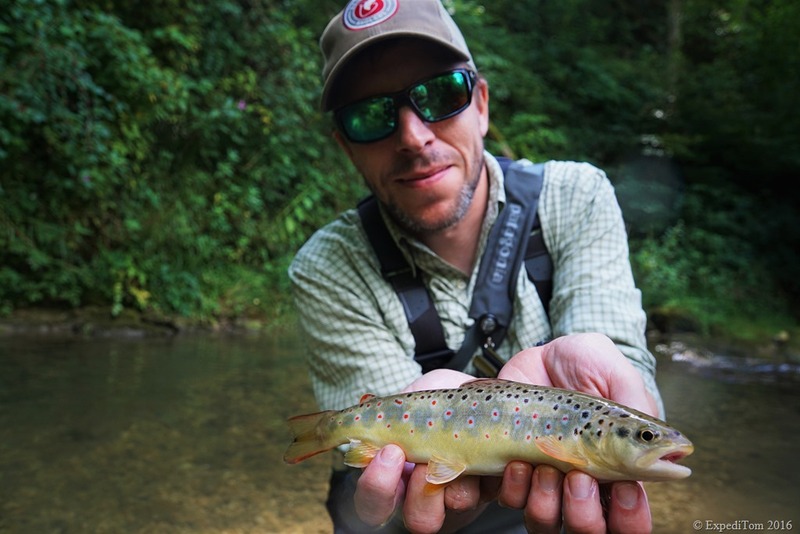 Although the water level was way too low, André managed with his Scott F2 glass fibre rod to hook and land a brown trout on a Naturalia nymph bought from Fly With Us. The scenery impressed me. The small creek slithered through jungle-like forest with a lot of vegetation and moss-covered stones. Logs were lying across the bank and there was even a sandstone wall soaring at least 50 metres into the sky with prehistorical caves in it – just amazing. 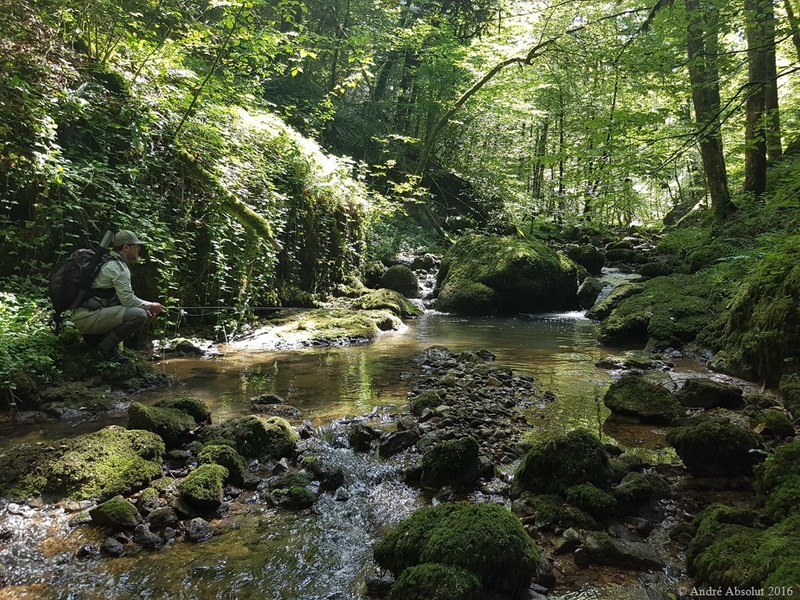 Having been fishing and exploring the Jura mountain creek during the morning we decided to visit the next stream. 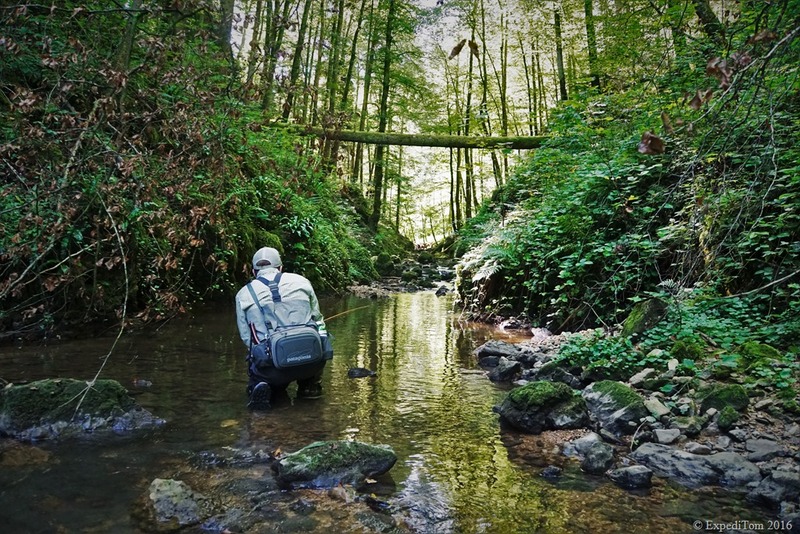 The next creek I have been exploring before so I showed André some nice spots, about whom you find in the post about Fly Fishing a Jura mountain creek. At the beginning of fishing the Long Pool there was no sign of any fish on the surface. 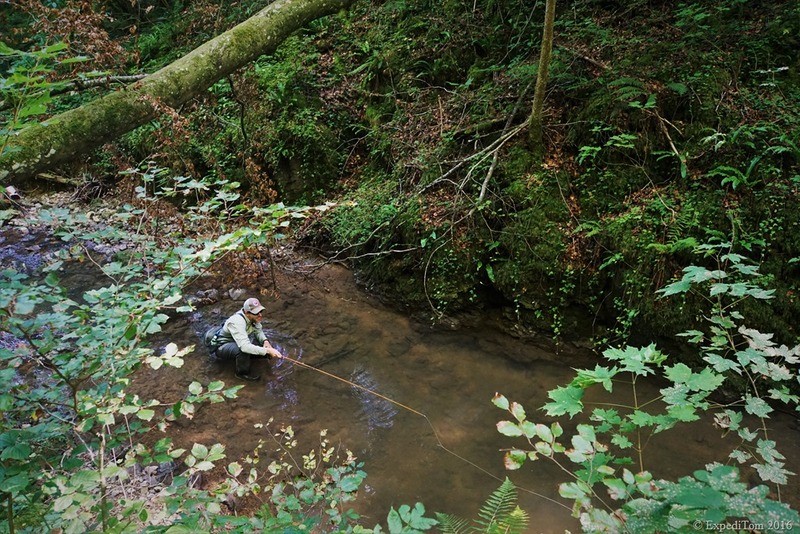 Therefore, we chose to go with the dry fly-nymph rig. Shortly after, André put the rig perfectly in to the current and I instantly knew that there will follow a bite. 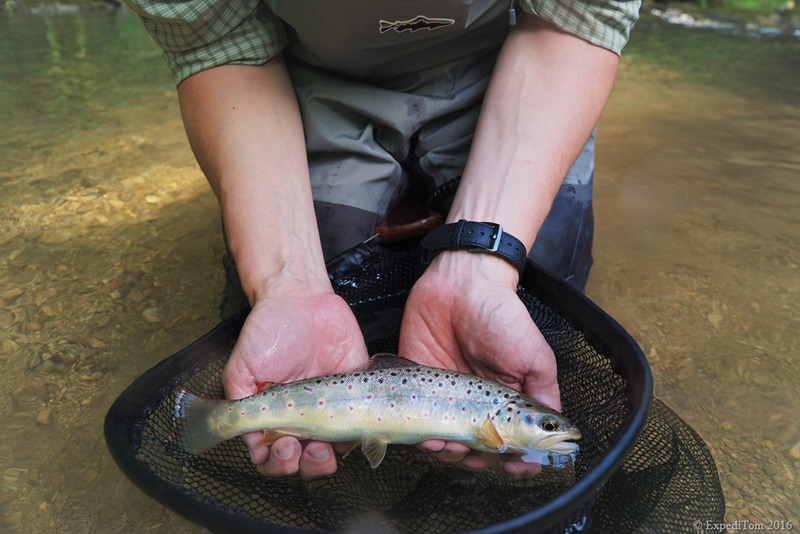 So I counted aloud: ‘Three – two – one …’ All of a sudden a splash on the surface made the dry fly disappear. ‘zero’, I yelled and simultaneously André set the hook. 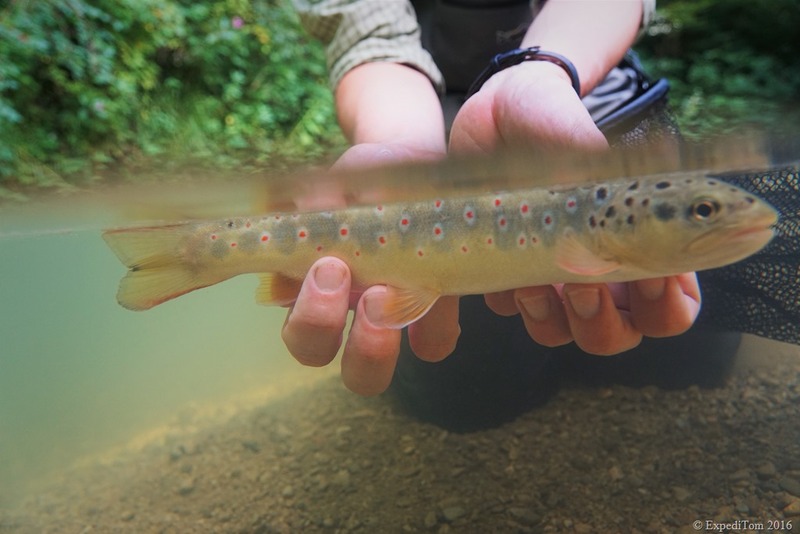 A wonderful brown trout found its way to the net. We spent at least an hour at the very same spot and the action continued, although my action consisted mostly of loosing fish under stumps and flies in branches. Bugger. 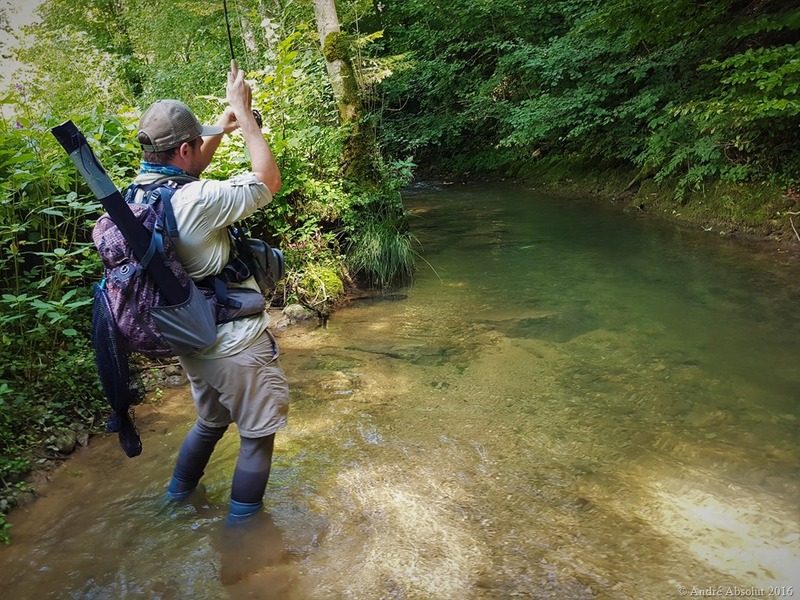 Still I enjoyed fly fishing and exploring the Jura mountain creeks with André, in particular because we found a perfect balance of fishing alternatingly. The last part of this day we spent at the very same creek but at another place, which I did not know before. The story continued that I messed up with several trout. However, as successful André was at catching fish, as good was my eagle eye to find other animals. 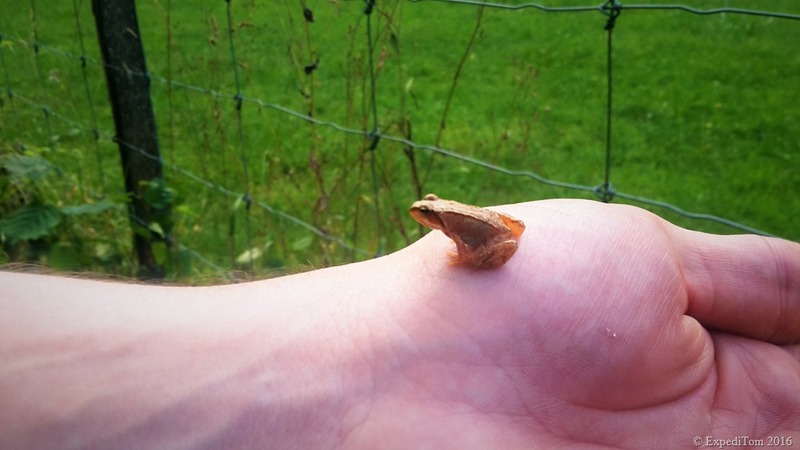 Not only did I find a small European frog, but I discovered also a huge ring snake below the water surface. The snake must have been at least one meter. At the final pool, there was a distinctive bubble line. I casted the Royal Wulff on the 12 foot leader with 0.12mm tippet slickly between a rock and the bank. 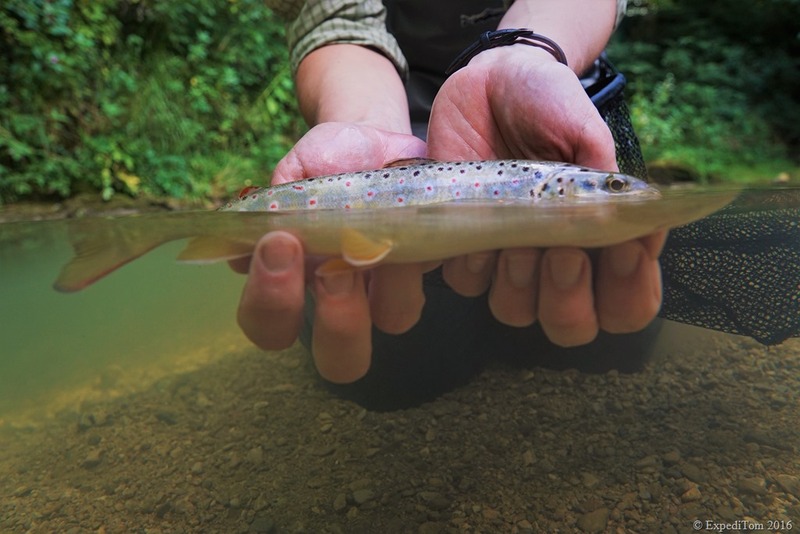 As soon as the dry fly floated around the stone a sudden splash proofed my expectation to be right. André mischievously told me to be careful not to lose this fish. At the very same time the trout pulled to the bank and disappeared under a stone, whereas the dry was hurled at us. We both laughed. 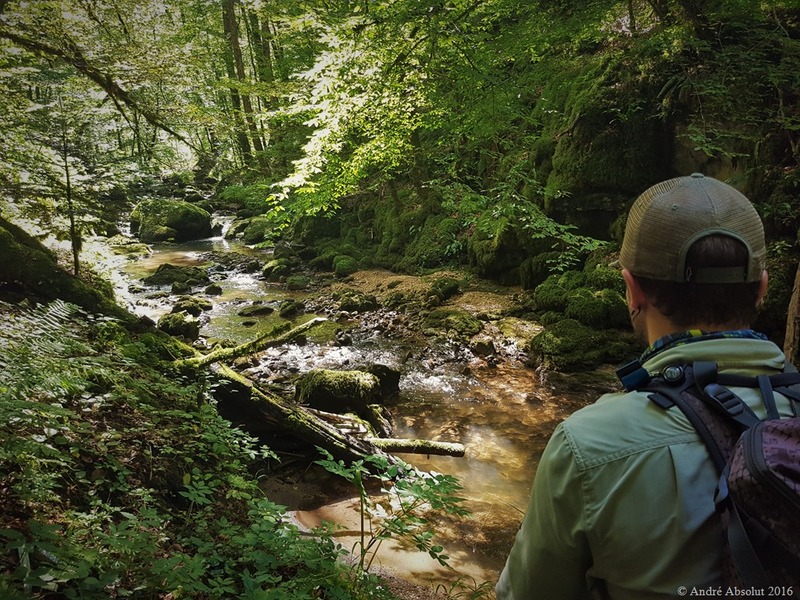 All in all it was a great experience exploring the Jura mountain creeks together with André. 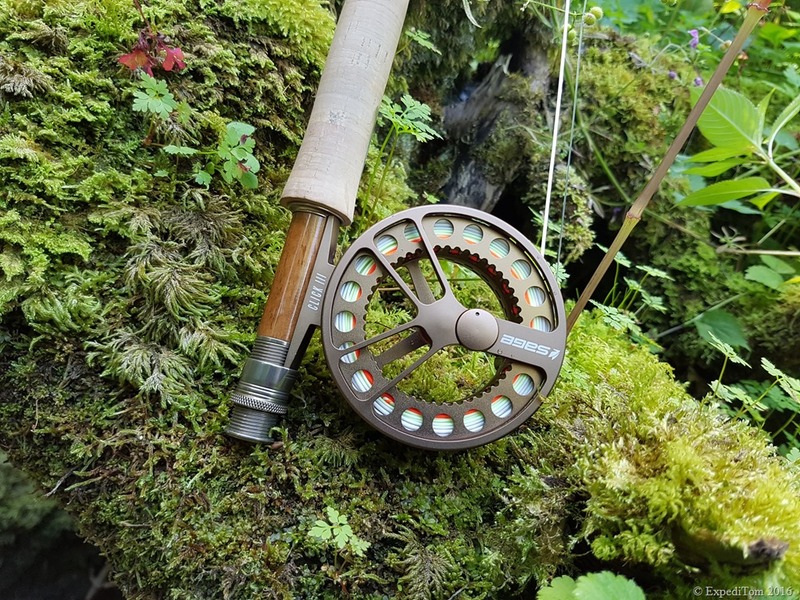 Although I did not net any fish, it was a wonderful day fly fishing and exploring the Jura mountain creeks. Thanks André for the exciting trip we had, it was a pleasure to fish and explore with you!